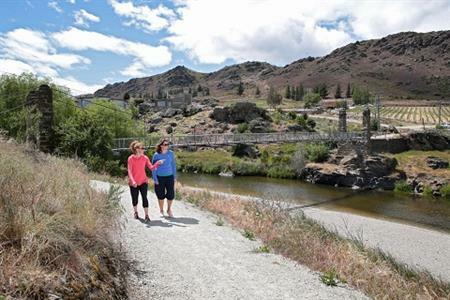 To travel to Central Otago is to journey into New Zealand’s golden heartland. Its many towns and settlements are founded on the pioneering spirit and back-breaking toil of farming run-holders and adventure-seeking gold miners. These places lie nestled amid the grandeur of towering mountain ranges, stunning rocky tors, sweeping plains, valleys, gorges and meandering and mighty rivers. The vibrant commercial centre of Alexandra is the region’s business, cultural and political capital. All the services and conveniences of a modern centre are here. Nearby the historic Clyde township is home to a hydro-electric dam. The area includes the Earnscleugh Valley and Fruitlands with orchards, vineyards and gold mining remnants. Cromwell is a growing commercial centre situated on Lake Dunstan. The area is known as the fruit bowl because of its orchards. Farming has long history here and there is also a strong quartz mining heritage. Viticulture has successfully emerged in recent times and is particularly prominent at Bannockburn. 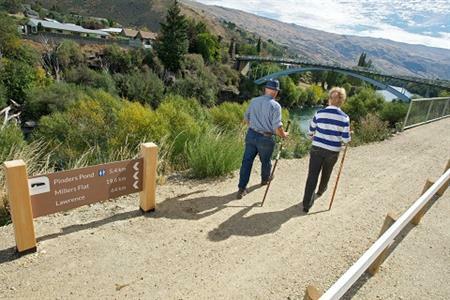 Roxburgh is situated along the banks of the Clutha River and is another famous fruit growing area. The lake was formed by the nearby hydro-electric dam and like Cromwell’s Lake Dunstan, it hosts a variety of recreational water activities. Long empty roads stretch out to the sleepy townships of the Manuherikia Valley. There are historic schist stone and mud-brick cottages buildings along the way. Ophir and St Bathans are particularly well-preserved living townships of the gold rush. The latter is close to the Blue Lake and with its glaring-white cliffs – a consequence of hydraulic digging. The Maniototo Plains of Central Otago feature remnants of the gold mining era and irrigated pastures. The historic Hayes Engineering works showcases some of farming’s best innovations. 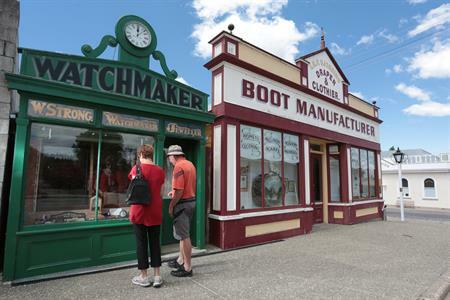 Maniototo’s many townships include Naseby the country’s curling (ancient, Scottish ice sport) capital with a full indoor rink; and Ranfurly, famous for its art-deco architecture.